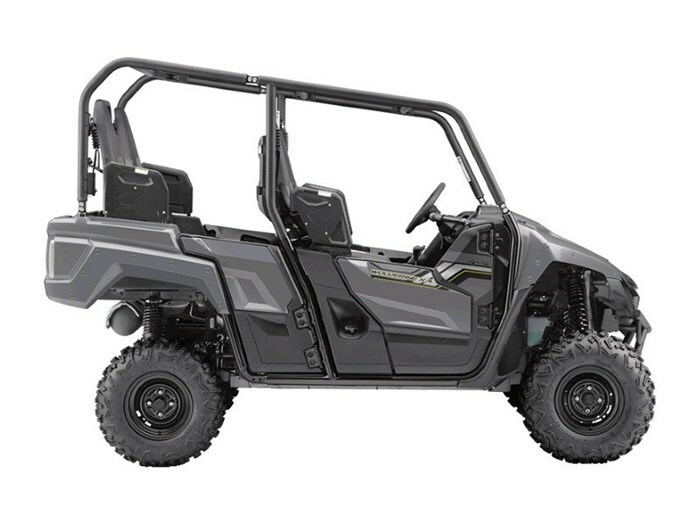 2018 Yamaha Wolverine X4 EPS Dark Gray CONQUER DIRT Designed to be the ultimate adventure partner, the proven off-road Wolverine X4 is all-new for 2018 and provides the best combination of capability, comfort and confidence during outdoor excursions with family and friends. The Wolverine X4 offers unmatched overall off-road performance in the widest variety of terrain and conditions. Try it for yourself and see where your next adventure will take you! TERRAINABILITY The Wolverine X4 boast Sachs self-leveling rear shocks with dual rate springs. These shocks help provide consistent ride comfort and maintains wheel travel when the unit is loaded to offer ideal compatibility wherever your adventure takes you. POWER The all-new 847 cc, liquid-cooled in-line twin is designed to provide a smooth, quiet operaton for maximum enjoyment and features a "Speed Key" to limit the vehicle's top speed to 40 km/hr. DESIGN Roomy 4-person seating is offered through contoured high back bucket seats that offer an industry only 4-to-2-seat convertible bed. Superior versatility makes it easy for hauling passengers or gear without sacrificing class-leading terrainability. Features may include: ENGINE Rubber mounted, compact, 847 cc, liquid-cooled, DOHC, 8-valve (4-valves / cyl), inline twin cylinder engine with Yamaha's Chip Controlled Throttle (YCC-T) provides lots of torque across the rev range with linear throttle response. 4-valve, downdraft style combustion chamber with 10.5:1 compression ratio. Lightweight hollow camshafts. "Cross Plane Concept" 270 degree crankshaft. Lightweight gear driven balancer shaft. Forged connecting rods feature a "nut less" design. Lightweight, concaved forged aluminum short skirt pistons. "Liner less" bores with direct nickel ceramic plating sprayed directly on the aluminum block. Offset cylinder design. Dry sump lubrication system with heat exchanger type oil cooler. Yamaha Chip Control Throttle (YCC-T) system (a.k.a. "fly by wire throttle"). "Closed loop" dual 36 mm Mikuni throttle body fuel injection. Easy access, high mounted, high flow 11.5 litre air box features primary & secondary air filters. CHASSIS Rugged, compact, round tube steel frame. Full length steel under frame skid plates (high impact plastic front plate). ROPS roll over protection structure (ANSI / ROHVA-1-2011 standard). Speed sensitive, rack & pinion-type, Electric Power Steering (EPS). Adjustable, independent double wishbone front suspension with front stabilizer bar. Dual "Wide Arc" style front A-arms. Adjustable, independent double wishbone rear suspension with rear stabilizer bar & self leveling rear shocks. Four-wheel hydraulic disc brakes. High-Performance 26" MAXXIS tires & aluminum die cast mag wheels. 35 litre fuel tank.